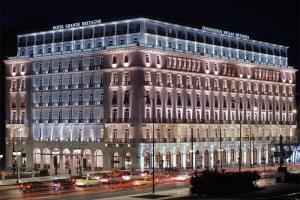 With breathtaking views of the fabled Acropolis, regal Syntagma Square and the Parliament, lush Lycabettus Hill or the original Olympic Stadium, the multi-awarded Hotel Grande Bretagne, A Luxury Collection Hotel offers an unrivalled perspective of Athens' mythical history. Situated right in the heart of the city, the landmark hotel is within walking distance of exclusive shopping areas, museums and the business district. With meticulous attention to every detail, each of the 320 rooms and suites marry charming old-world elegance with state-of-the-art facilities, and offer enchanting views of the hotel courtyard or the city's timeless landmarks. Located 45 minutes from the Eleftherios Venizelos airport. GB Roof Garden, Winter Garden, Alexander's Bar, Alexander's Cigar Lounge. New Acropolis Museum, The Ancient Agora, Plaka, Thission, Monastiraki Flea Market, Olympic Stadium of Modern Times, National Gardens.